It seems these days, that I haven’t had as much time to play with paper as I would like, but a week or so ago, I sat down and made this card with a friend in mind. It came together so fast too! Are you familiar with Simple Stories? They make scrapbook paper, and I think it is some of my very favorite! They have a line called [email protected], they are 12×12 sheets and they are sectioned off for you to cut apart really easy, see what I’m talking about here. Well, I decided I was going to use a 3×4 card from this paper and make a card. 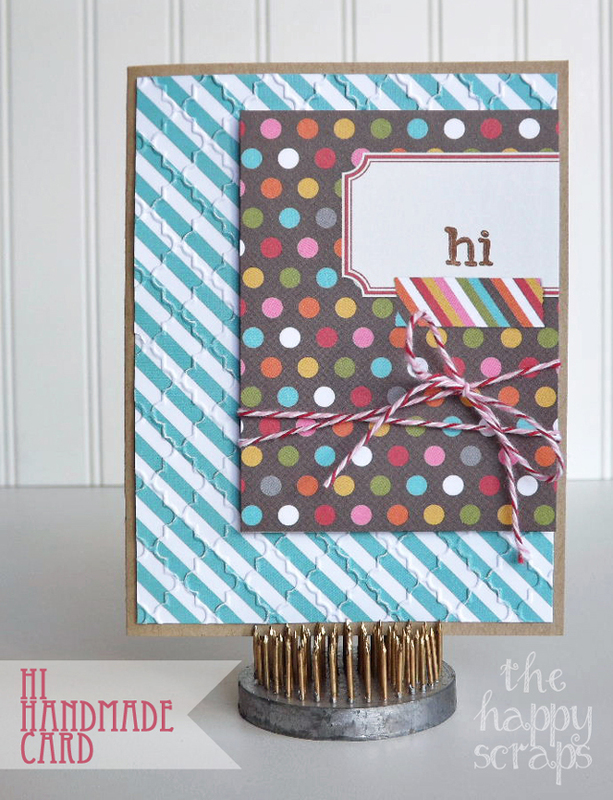 I found the one I wanted to use and cut it out, then I stamped my “hi” on it then wrapped it in twine. Next I cut out the teal striped paper to be mounted on the kraft cardstock. I sent that through my Cuttlebug (OH.MY.GOODNESS! Have you ever used one of those things?!?! SO.much.fun!) and then put it on my card. After that I used dimension dots and put the smaller piece of paper on top. It was so fast! Don’t you just love that embossed paper? I do! I hope when I sent this card in the mail to my friend that it brightened her day! On a side note, did you guys notice my flower frog? I’ve seen these in pictures before but never knew where to get them. The cute girls over at Cake for 2 posted about it and I headed to Micheal’s the next day and picked one up! They are on the floral aisle btw. So cute Amy! I am pinning to my card board so I can remember this idea for later. Thanks! Hi Amy. Love you card. Glad I saw it on Take a look Tuesday. I am your newest follower via GFC and twitter. Would love for you to stop by my blog. I love connecting with other crafty people. Cute card! 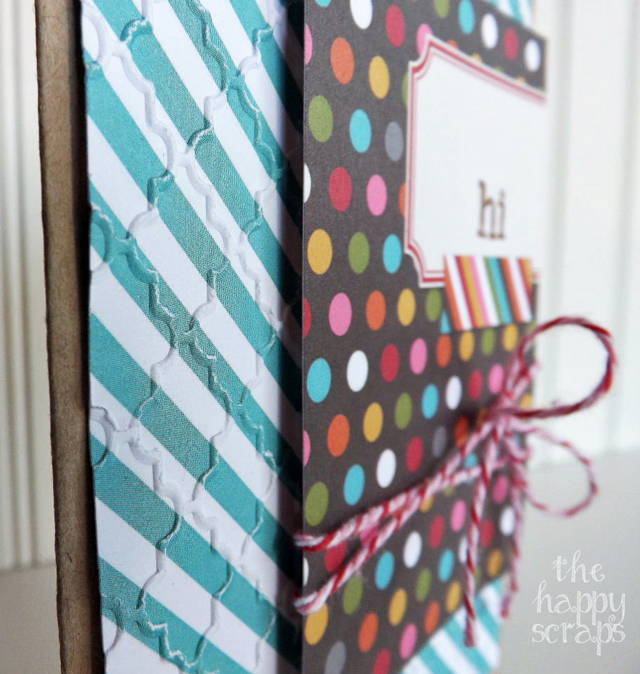 I bought the same folder from Stampin’ Up! so will be making a card just like yours this weekend!